Those looking for the biggest wins should check out the collection of progressive slots at Winner Casino. They are linked to enormous jackpots that are growing all of the time, and there is more than enough variety of game to ensure that there is something for every taste. Discover three of these games below. 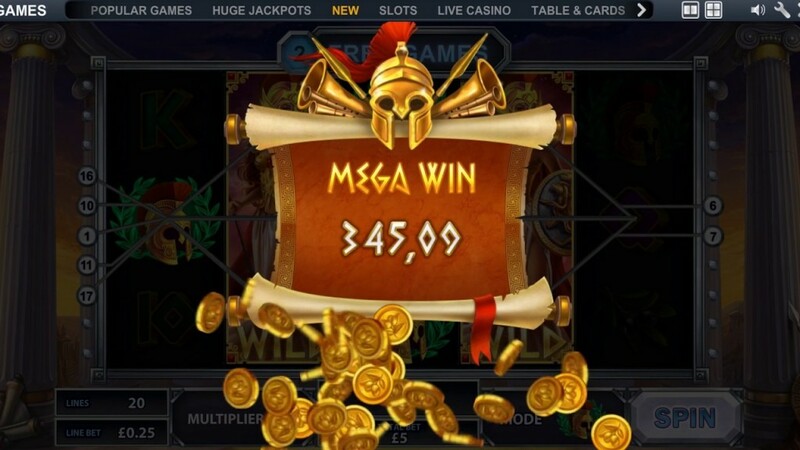 Recently a new slot based upon the hit film Gladiator was released at Winner Casino, but many players are still enjoying the original game themed on the film. This is because, not only does the slot offer some fantastic features, but also it is linked to a progressive jackpot that is rapidly approaching the £1 million mark! Gladiator Jackpot is a 5 reel slot with 3 rows and up to 25 paylines. Behind the reels you can see the curved wall of the Coliseum against a yellow sky. The high value symbols are characters from the film and include Antonius Proximo, Juba, Senator Gracchus, Lucilla and Commodus. The lower value symbols are the playing cards 9 through to A. The gladiator helmet is the wild symbol, it can land on the middle three reels and when it does, it will substitute for all of the other symbols, except for the scatter symbols, to help and form winning combinations. The scatter symbol is the Coliseum. To be in with a chance of winning this enormous progressive jackpot you first need to trigger the Gladiator Jackpot Bonus by landing the bonus symbol on reels two, three and four at the same time. You will then be shown nine gladiator helmets, each one made from gold, silver or bronze. The three metals are worth different cash prizes, with bronze the least valuable and gold the most. If all nine of the helmets are made from bronze then the jackpot is yours. If you can land three or more of the scatter symbols anywhere on the reels the Coliseum Bonus game begins. You will see a wall with four layers of stone. The layers are labelled ‘Free Spins’, ‘Multiplier’, ‘Extra Scatter’, and ‘Extra Wild’. You need to choose a stone from each level to reveal a bonus and the free spins begin once you have finished picking, complete with the accumulated bonus features. Best of all, during the free spins each time that Commodus lands on the third reel you will win three more spins. Gladiator Jackpot also offers a gamble feature that you can use after any successful spin to try to double the payout. All you need to do is guess the colour of the next card to be drawn from a pack. The payout is doubled if you guess correctly and you can repeat the process until you hit the gamble limit. However, if you make one incorrect guess then all your winnings will be lost. The game has a betting range of £0.01 up to £500 per spin. In addition to the progressive jackpot, it offers a huge top fixed payout of 5,000x for landing five Commodus symbols on a payline. Lucilla can payout up to 1,000x, Senator Gracchus can payout up to 350x, and Antonius Proximo and Juba can both payout up to 250x. 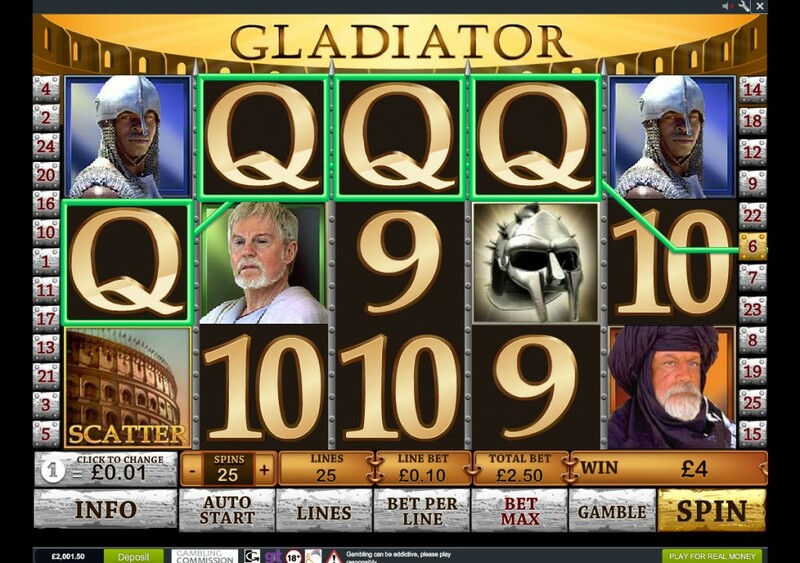 If you want to see if you can win this jackpot worth close to £1 million, start playing Gladiator Jackpot slots today! The Age of the Gods series of games are hugely popular with players at Winner Casino. This is because they offer hours of fun, rewarding features, and the chance to win four progressive jackpots. At present, the slot Age of the Gods: Goddess of Wisdom is giving players to win a jackpot worth over £570,000! Age of the Gods: Goddess of Wisdom is all about Athena and it is a 5 reel slot with 3 rows and up to 20 paylines. The reels are set in between two columns from an ancient Greek temple with more temples just about visible in the background. There are five high value symbols, Gorgonian (a magic pendant showing the Gorgon’s head), helmets, armour, sandals and olive branches. The lower value symbols are the playing cards 9, 10, J, Q, K and A.
Athena herself is the wild symbol, she can land on the middle three reels and will substitute for all the other symbols, except the scatter, to help and complete winning combinations. The scatter symbol is an owl carrying a scroll. If you want to win this huge progressive jackpot then all you need to do is keep the reels spinning as the jackpot game can begin at any time, regardless of what you are betting or what symbols land. In the jackpot game you will see a grid of twenty coins and need to pick from them one at a time. Each coin represents one of the four jackpots and once you have found three matching coins, you will win the corresponding jackpot. From smallest to largest the jackpots on offer are: Power, Extra Power, Super Power and Ultimate Power. The best thing about the jackpot game is that once it starts, you are guaranteed to win one of the jackpots. When three or more owl scatter symbols land anywhere on the reels the Battle Game begins. In the Battle Game the city is under attack and you need to help Athena defend it. The three highest value symbols (the Gorgonian, the Helmet, and the Armour) represent the different defensive modes. If you choose the Gorgonian you get 10 free spins, the Helmet awards 7 spins with a 4x multiplier, and the Armour awards 14 free spins with a 2x multiplier. During the spins, the chosen defence symbol will replace the other two defence symbols on the reels. This means that there are fewer symbols in play, and as a result, it is easier to land wins. Best of all, the wild symbol becomes an expanding wild in all three modes. Why not find out if Athena in all her wisdom will grant you the huge jackpot by spinning this slot today! If want to go and explore the desert, and while you are there look for some lost treasures, then give Desert Treasure slot a spin, and you could win a progressive jackpot that is worth around £70,000! 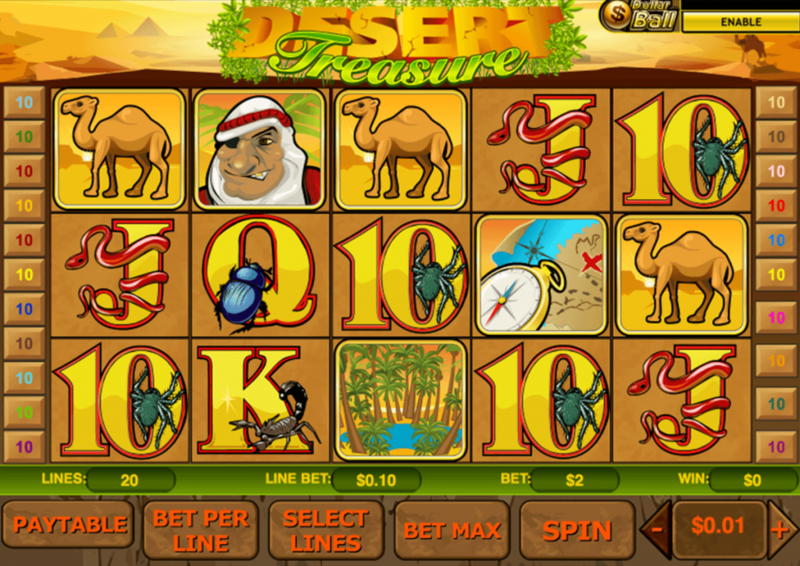 Desert Treasure is a 5 reel slot with 3 rows and up to 20 paylines. The reels take up most of the screen, but above them you can see the rolling dunes of the desert and some distant pyramids. There are just three high value symbols, an oasis, a camel, and a man wearing an eyepatch. The lower value symbols are the playing cards 10 through to A decorated with beetles, snakes, spiders, scorpions and lizards. The wild symbol is the golden cobra, it will substitute for all the other symbols except the scatter and bonus symbols, to help and form winning combinations. The scatter symbol is the desert princess and the bonus symbol is a compass and a map. If you want to play for the progressive jackpot then you first need to opt into the Dollar Ball jackpot game. Next, you need to pick five numbers between 1 and 49. A lottery style draw will take place with each spin of the reels and you win prizes based upon how many numbers you have matched. Matching one, two or three numbers awards a fixed payout of 1x, 2x or 25x respectively, matching four of the numbers awards 1% of the progressive jackpot and matching five numbers awards the entire jackpot. If you land three or more bonus symbols anywhere on the reels you then will be taken to a screen where you need to choose from a number of chests. You can choose the same number of chests as there were bonus symbols that triggered the game, and each of the chests will award you a cash prize. If you can land three or more of the princess scatter symbols anywhere on the reels you will win ten free spins. Best of all, not only can the free spins be retriggered indefinitely by landing more scatters on the reels, but also all of your winnings will be tripled! Desert Treasure has a betting range of £0.01 up to £400 per spin so everyone can give it a try. There is a huge top fixed payout of 10,000x up for grabs if you can land five wild symbols along a payline. The oasis can payout up to 500x, the camel can payout up to 400x and the eye-patch wearing man can payout up to 200x. The desert princess scatter symbol also offers huge payouts of up to 500x your total bet. Take yourself on a desert adventure today and with a bit of luck, you will be the winner of this huge progressive jackpot.